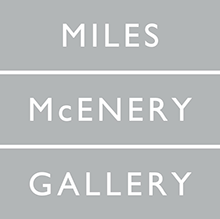 New York, New York – Ameringer | McEnery | Yohe is pleased to announce its first solo exhibition of paintings and sculptures by Los Angeles based artist Michael Reafsnyder. Feast will open on February 3, 2011 and will remain on view through March 5, 2011. A reception for the artist will take place February 3, between 6:00 and 8:00 PM. The public is welcome. Developed with a true sense of optimism, the paintings and sculptures in this exhibition offer the opportunity to confront happiness rather than search for it. Reafsnyder’s distinct style is a fresh departure from the serious and complex inspirations often rooted in Abstract Expressionist art; Instead, the complexity of the work lies within the methodical process in which it is created. Despite the appearance of effortless spontaneity, each gesture is carefully crafted and thoughtfully organized. The thick applications of acrylic, animated brush strokes, and fiercely fantastic use of color ignite a wildly contagious energy. Reafsnyder’s colorful ceramics echo the liveliness and exuberance in his painting. Clay or canvas, Reafsnyder’s playful work will leave you with a smile long after the conversation has ended. Michael Reafsnyder was born in Orange, California and currently lives and works in Los Angeles. He received his BA from Chapman University in 1992 and went on to earn his MFA in 1996 from Art Center College of Design in Pasadena. Reafsnyder has exhibited in several solo and group shows across the country including exhibitions at RB Stevenson Gallery; Rebecca Ibel Gallery; Mark Moore Gallery; the Las Vegas Art Museum; Laguna Art Museum; and Western Project. His work is also part of selected public collections including Los Angeles County Museum of Art; Museum of Contemporary Art San Diego; Columbus Museum of Art, Ohio; and Portland Art Museum, Oregon. In Michael Reafsnyder’s joyously frenzied paintings, each rectangular picture, with its layers of drips, swirls, daubs, and arcs, in every hue imaginable, was also a map of its own creation. 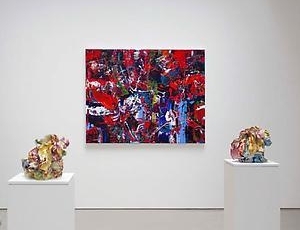 Together with his cacophonous multicolored, biomorphic ceramic sculptures, these works seemed primarily designed to energize their audiences. For his showy topography, Reafsnyder used a variety of application methods: spreading the paint with a flat edge, allowing it to drip from above, applying it directly from the tube, touching it with his hand (or perhaps his arm), or, while the paint was still sticky, lifting it off the surface. The lush, thick surfaces put one in mind of cake frosting as much as they did Abstract Expressionism. 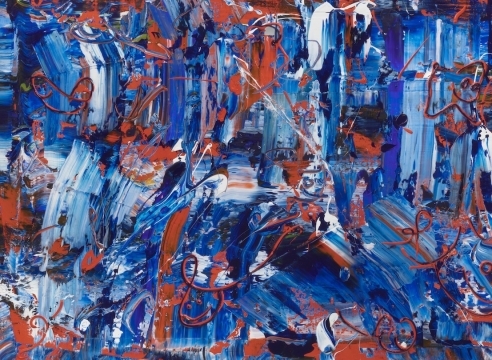 Arguably Gerhard Richter’s spirit was being channeled—and challenged—as was Jackson Pollock’s.